This is the second in our developments of new-generation LED headlamp upgrade bulbs using new high colour rendering index LEDs only ever used before in high end retail lighting. Their superior qualities make night vision less like hard work and reduce driver fatigue but letting you distinguish all of the different shades of colours and between similar colours. These also allow the bulbs to produce more light that before, which is almost double that of the original bulb, but only consuming 15 watts on dipped beam and 25 watts on main beam. The beam pattern is good in headlights in good condition. 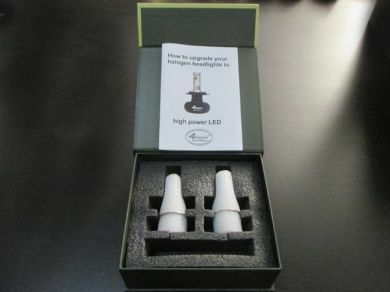 The new developments also make it possible for us to give a 5 yr warranty on these bulbs. No one has ever given more than a 2 yr warranty before. The price is for a pair of these new bulbs only and does not include VAT if applicable or P & P. These are the positive earth ones. See also the neg earth version listed separately.